we will all enjoy looking back at them as we grow older. Overall, we had a great day and we really enjoyed the experience. 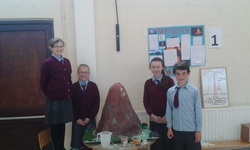 On the 24th of May 2016, the 5th and 6th class students of St Andrew’s unveiled their projects on ‘The 7 Natural Wonders of the World’. At one o’clock, the whole school gathered in the P.E. hall where 5th and 6th had prepared their presentations. The seven groups were; Paricutin, The Northern Lights (also known as Aurora Borealis), The Harbour of Rio De Janeiro, The Great Barrier Reef, The Grand Canyon, Victoria Falls and Mount Everest. There were three or four students in each group. Each team had a diorama or display as well as written information for the audience to look at. As the crowd moved around the room, each group verbally presented and displayed their projects. The work on view was extremely impressive. Much imagination had gone into these projects and and lots of unusual displays had been created. The Great Barrier Reef exhibit even had a fish tank with real fish, and the Paracutin group had constructed a massive exploding volcano! The Mount Everest display consisted of a delicious Mount Everest Cake which the pupils of 5th and 6th ate after the presentation. On Tuesday 24th May it was a gorgeous day to play outdoors. 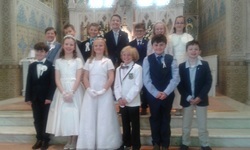 9 and 10 year old pupils of St. Andrews National School set out to play Ratoath Harps, who have been together for a long time. The atmosphere was electric. The players on both teams were eager to get on the pitch in Ratoath. Families were excited and cheered on in support. Both teams pressured the ball from the whistle. The ball went up and down the wings and crossed into the centre. Jared scored the first goal for Curragha, but Ratoath soon equalised. Christopher and Johnny both scored then and kept the pressure on Ratoath. Our coaches were buzzing with substitutions and encouragement. David is a soccer fanatic (Liverpool supporter) and Ms. Ronan, 1st and 2nd’s teacher who has a great interest in competitive sport (Arsenal supporter). With five subs in total, each player got plenty of playing opportunities. With the score five-one, we were more comfortable with our game. Nick and Kieran had close encounters with the net. Powerful passing and movement of the ball kept us in the lead. We were determined to keep the scoreboard in our favour. The final score: 5-2. Ratoath Harps were a fantastic team to play and gracious in defeat. At the end of the day, St. Andrews had super play and an excellent game with fun packed in. We have excellent potential, players are eager, coaches are dedicated and supporters are encouraging. ​Barnaby Bear is a teddy. He is passed around in my class and everyone gets to bring him home. When you bring him home you get to dress him up and you can watch movies with him and it's very fun when Barnaby comes over! There's a book in his box and you write in the book and tell the class what you did with Barnaby Bear. I brought him for hot chocolate and then I played with him in my room and had a teddy party, Juliette fed the horses with him, James played football with him, Ciara baked buns with him and Jamie made a blanket and pillow for him. You can do anything with Barnaby Bear and he is the best bear ever!